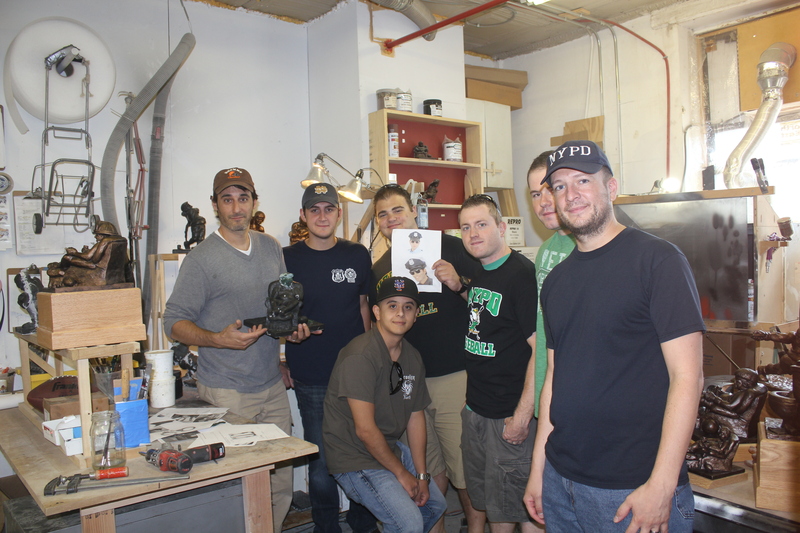 A fantasy football trophy specifically designed for the police is what brought 6 cops from the New York City Police Department to Fantasy Trophies yesterday. The last time we had that many police was when a guy crashed his motorcycle up the block and then fled on foot before being pepper sprayed, tackled and restrained by what seemed like half the department right outside our doors. That was quite a memorable day at FantasyTrophies.com, but I digress. Yesterday was a bit more mellow as Ali, Mike (Snaps), Johnny, Joe, Mike, and Joe all took time on their day off to come by and see the progress I’ve made on the NEW fantasy football trophy, the Armchair Quarterback Policeman. As you may have read in a previous post, the idea to create such a trophy grew out of an email I received from Ali a few months ago. He was wondering if I could sculpt a trophy for his own fantasy football league that he and 11 other members of the NYPD were in. Of course Ali is the reigning champ so he really wants the trophy ASAP. 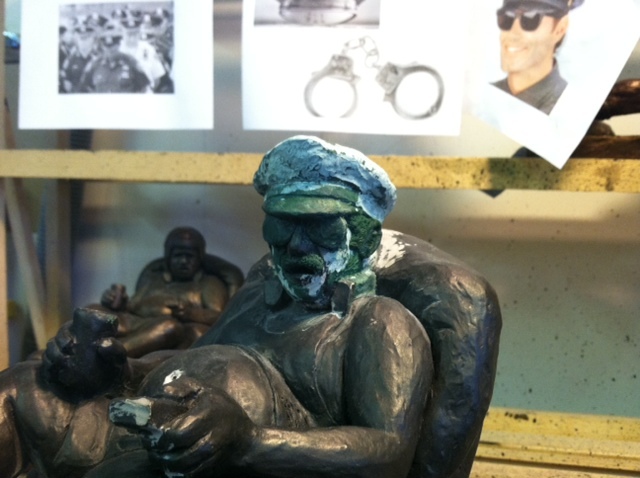 At the time I wasn’t able to do it but, after sculpting a similar trophy for firemen, I realized that a trophy for the police had to be next on my agenda. In email exchanges with Ali over the past couple weeks we came up with some really great ideas. His and my enthusiasm for the project led to having some of the guys from his league swing by the shop to take a sneak peak and “brainstorm” over what else could be added to the trophy. After BS-ing a bit about how I’ve been involved in fantasy football since 1990 and how the original trophy came to be, it was time to go inside and take a look. The guys were definitely pleased with what they saw and my mind was put at ease when they all laughed at the sculpted donut that was resting on the arm of the recliner. A touch they all appreciated since their league is call the “Dunkin Donuts Lounge.” All of them also really liked the 1970’s mustache he was sporting and aviator glasses he had on. After discussing a few design options we all came to the same conclusion. The new sculpture would have a gun secured in a shoulder holster that would subtly peak out above the rim of his belly. It would also have an old school police baton that would rest on one side of the recliner with a set of handcuffs on the other and a few randomly placed bullets and crushed cans. I gotta say, getting feedback and input directly from cops in the NYPD regarding a fantasy football trophy I’m sculpting for them is something I NEVER thought I’d be a part of when I sculpted my first trophy nearly 20 years ago in my parent’s garage back in Cleveland, Ohio. The journey and relationship with fantasy sports I’ve had has taken me on some pretty interesting paths. This one with the new police trophy I feel though is just beginning. Stay tuned to the trophy’s progress. Here is your own little sneak peak at the trophy in it’s development. If you have any questions contact me at Dave at FantasyTrophies.com. The sculpted revolver that will be added to the police trophy. 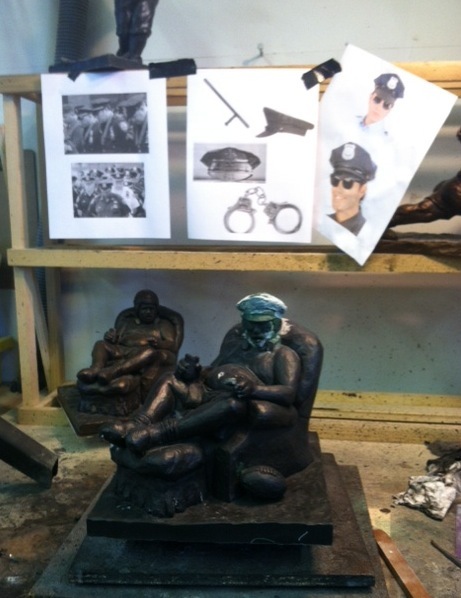 A few months ago I received an email from Ali, a policeman here in Brooklyn, asking if I would be able to sculpt a fantasy football trophy for cops. At the time I was busy stocking up on inventory for the beginning of football season and said I wouldn’t have the time and that a custom trophy would cost quite a bit. Though disappointed, he understood and said if I ever developed a trophy specifically for cops he’d be the first to order one. A couple months later I found myself having a similar conversation but this time with a fireman in Florida. The difference however was that I had some free time and thought I’d give it a shot. The Throwback Fireman would soon be born. 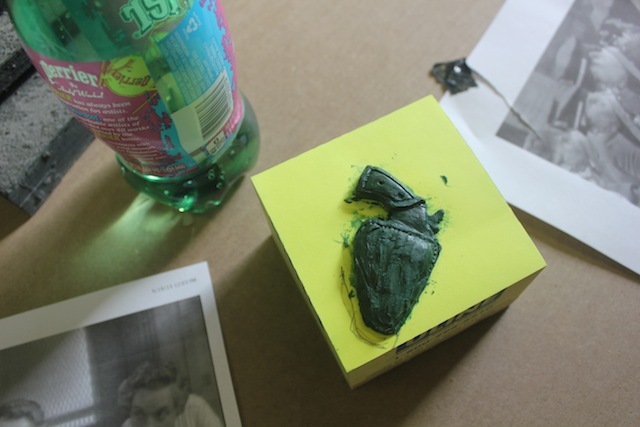 I liked the results so much that I put it up on my blog and since then have sculpted an Armchair Quarterback Fireman to rave reviews. Both trophies will soon be available on FantasyTrophies.com. Re-enter Ali. 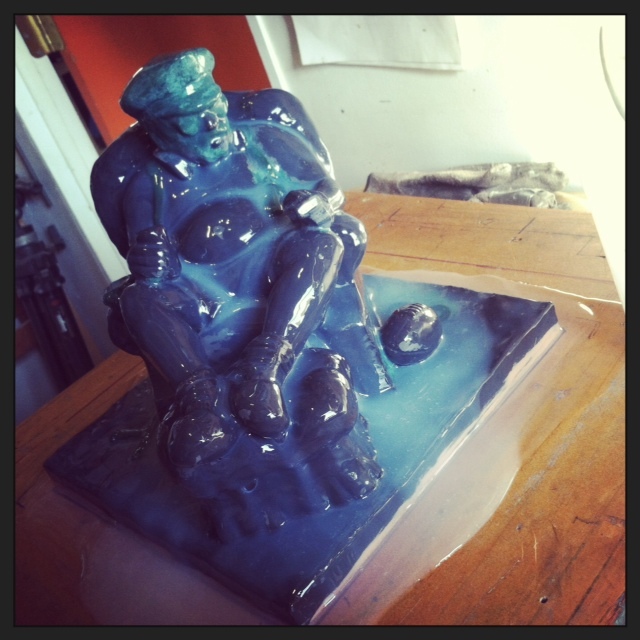 Seeing that I went ahead and sculpted a trophy for fireman and not the police, Ali reached out to me once again. He was incredibly enthusiastic about seeing a similar trophy sculpted for cops and went gave me a number of reasons why it would be a great idea. It didn’t take much convincing. I knew it would be a hit and something I’d really enjoy doing. 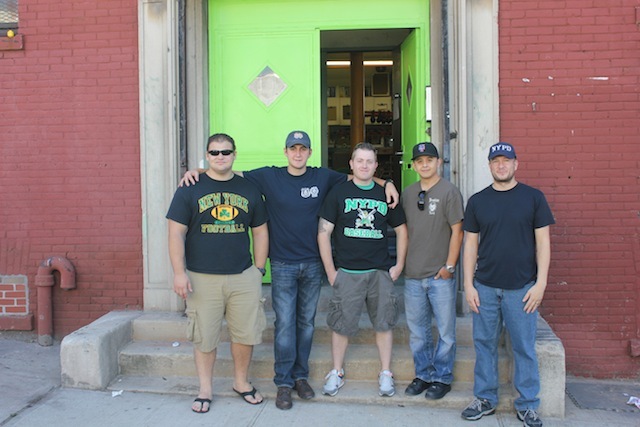 The great thing is that Ali and a few other Brooklyn policemen want to stop by the shop at some point to help work with me on the overall design and to brainstorm some ideas. One thing that I definitely wanted to be a part of the design was a nice mustache and aviator glasses. I was so excited with the idea that I got right to work. As you can see, the Armchair Quarterback Policeman is well on it’s way and a fantasy football trophy that will stand alone to represent policeman everywhere.